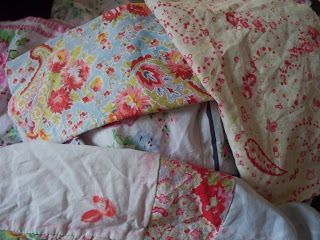 Homespun Stitchworks..... For the love of vintage: Monday Monday! Where your treasure is, there will your heart be also! Well it is Monday all ready and I have a busy but very enjoyable week ahead of me. I went to the wonderful vintage fair in West Sussex on Saturday and I am about to leave to go to Blandford to another one. So over the next week I will be reporting on both of these fairs and there will be show & tell as well. On Thursday I am on a train to London to the Country Living fair and on Saturday there is the West Country Vintage Fabric and Textile Market as well which I hope to get to. I can see not lots of stitching being achieved this week I am afraid. I will have to collate all the photos and get you some good blogs going on. I am a little tired as well, I felt so good and better that I have packed an awful lot in and hope that I will not regret it. Still it is one of those weeks that are busy and exciting so I must not complain at all. I am looking forward to today and hoping to see some of my friends and meet some new and exciting exhibitors to bring to you so that you can look out for them in the future. Wednesday is my design day as you know but it may turn into a stitching day instead this week because as I said it is London on Thursday. I can see this week flying by very quickly. The Country Living fair has some vintage stalls now and at Christmas one last November you may remember I went and bought some lovely treasures. There were only around four or five of the vintage stalls but it is building up and so I am hoping it might be attended by a few more this time. Jo Butcher will be there and for anyone who does not know who she is ..... Jo is an incredibly talented embroiderer and I love her work. She creates beautiful pictures that are framed and ready for you to just find a space in your home for. I bought a picture last November and it was a NOEL one which is beautiful and will come out every Christmas from now on. For today though I am looking for some more vintage threads and I really can not wait to show you what I found Saturday. Anyway have a fabulous day and as always Happy Stitching! Hello Sarah, it was lovely to meet you at Blandford this morning, thank you for giving me one of your cards so that I could find your blog. I enjoyed the fair and came home with one or two ‘paper treasures.’ I also had a nice walk along the river, and a little nosy in the charity shops. Perfect! Your blog is really, really pretty. Barbara. The fair was so good wasn't it .. It was a lovely day for a walk by the river and charity shop truffling. Thank you for your kind words and I am pleased you like the blog.